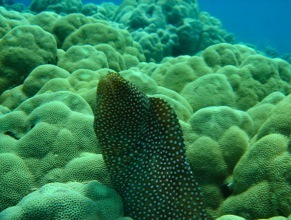 Ocean Pulse is a comprehensive study of coral reef ecology and the marine environment. It is an inspiring, hands-on program for students in grades K-college. These courses unite students and the local community as they conduct a field survey of our most precious natural resource – the ocean. Our ocean and beaches become a “Living Classroom.” Students learn to identify reef species, gather data, and compare it to previous studies. This provides vital information about the health of the reefs and promotes a positive direction for other ocean communities to follow. Students learn the importance of protecting a fragile ecosystem, how coral reefs interconnect with all species in the ocean, and crucial steps required to preserve our marine environment. Our next generation needs this knowledge in order to assure the life of our oceans. By the time the present students graduate from High School, they will have the consciousness that conservation is a positive, if not essential way of life. Ocean Pulse is aligned with grade specific content and performance standards. These courses provide teachers with valuable tools and community connections needed for carrying out on-going, “meaningful” experiences in their classrooms. The Ocean Pulse Outreach Department provides teachers with opportunities for professional development in the area of environmental education. Teachers that weave critical environmental issues together with classroom and field activities can stimulate interest and lead young people toward thoughtful stewardship of natural resources. The Ocean Pulse manual provides a standard for student marine education, coral reef study, and the gathering of baseline information. These standardized and easy to follow courses may be utilized by school districts in diverse locations worldwide. Our vision is to establish a global network (via the Internet) of informed and empowered “Ocean Guardians” to assure the life of our oceans. Students focus on the complex relationships within ecosystems resulting from changes in climate, human activity, and the introduction of non-native species. Activities include investigating the formation of the islands, determining fish & turtle population assemblages, coral reef monitoring, classifying and mapping native and introduced species, measuring biotic and abiotic factors of different ecosystems, marine mammal study, and applying international oceanographic sampling and research protocols to define the marine environment. Students also “Adopt-A-Reef” and become “Ocean Guardians” of their local beaches. This information is made available to other students around the globe via the Internet. – All ages and Levels! Advanced Ocean Pulse! This Certification Program offers an exciting opportunity for students to engage in research, and receive hands-on training in marine sciences. This is a course on species identification and classification, calcification and structure of coral, origins and distribution of species, composition, zonation, reproduction, productivity, growth, species interaction, and identifies the role of algae and Zooxanthellae. Emphasis is on experiential labs to survey and monitor reef organisms using internationally known research protocols. Students learn ecological principles, conservation issues related to the Hawaiian Ahupua’a system and resource management methods. Most importantly, they realize the impact and consequences of human activities on reef ecosystems. Student “Peer Ecologists” may work directly with instructors to educate other students on the techniques used in Ocean Pulse. This instills pride and furthers interest in Marine Biology. Ocean Pulse @ Sea is a drug free marine education program that allows students to learn sailing, safe boating techniques, marine ecology, coral reef monitoring, environmental education, scientific research, and career training from local educators and community members aboard sailing research vessels. Research Vessels have ports in Hanalei Bay, Nawiliwili Harbor and Port Allen on Kaua’i, for year-round educational programs. These boats have served as research vessel for the following community groups: The Waipa Foundation, The Kaua’i Children’s Discovery Museum, Hawaii International School, Kula High, Intermediate and Elementary, Myron B. Thompson Academy, University of Hawai’i at Hilo, Na Pali Coast Ohana, and the Hawai’i Youth Conservation Corp.
Student Involvement: Students and community members are offered different levels of involvement in the program. 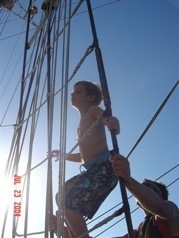 The first level of the program are activities that center on the boat: fieldtrips, whale watching, snorkeling & SCUBA, marine education, scientific studies, and sailing technique training, anything – simply as an alternative to being somewhere else doing drugs. The next level is a crew trainee position. Student volunteers will learn from qualified professionals how to crew the boat, eventually leading up to the next level, being a qualified or certified crewmember, or USCG captain. These crewmembers are subject to the USCG random drug-testing program, which is the ultimate deterrent to drugs. A person at this level will also be qualified for employment on a charter boat. The program is an alternative and deterrent to drugs, and a positive stepping-stone in the visitor industry on Kauai. Students are also trained as “ecologist tour guides” by members of Save Our Seas, in ecology, geology, biology and the Hawaiian cultural relatedness to these subjects. These quality sail training vessels are a unique and productive platform for the young people of Hawaii. As students participate on the research vessels, they are exposed to ideas in resource conservation by using environmental earth-friendly products and cleaning supplies, alternative energy sources like bio-diesel, and promoting recycling. These vessels are the SOS model for their yearly “SOS Coconut Award.” This award is given to local businesses that use environmental practices. Award winning businesses are chosen by the students. Ocean Pulse was a success in 1996 and 1997, and is again a success in 2003-2008 at Kula High, Intermediate and Elementary K-12 and 2003 a the Myron B. Thompson Academy on Kaua’i. High school interns serve as peer ecologists and lifeguards! Ocean Pulse could easily be introduced to island communities throughout the world; to teach the children how to identify creatures, compile marine data, and measure water quality. Caine R.N. and Caine, G. (1994). Making connections: Teaching and the human brain. Menlo Park, CA: Addison-Wesley Publishing Co.
Cuevas, M.M., Lamb W.G. and Evans, J.E. Jr. (1994). Holt physical science. Austin: Holt, Rirehart and Winston, Inc.
Dewey, J. (1966). Democracy and education: An introduction to the philosophy of education. New York: The Free Press. Gay, L. R. (1996). Educational research, competencies for analysis and application. Englewood Cliff, NJ: Prentice-Hall, Inc.
Hungerford, H.R., Litherland, R.A., Peyton, R. B., Ramsey, J.M. and Volk, T.L. (1996). Investigating and evaluating environmental issues and actions: skill development program. Champaign, IL: Stipes Publishing L.L.C. Knapp, C.E. (Aug 1992). Thinking in outdoor inquiry. ERIC Digest (ED348198). Stepath, C.M. and Chandler, K. (1997). Ocean pulse, coral reef monitoring project. Hanalei, HI: Save Our Seas. Willis, S. (1997, Winter). Field studies-Learning thrives beyond the classroom. Curriculum Update, p. 1-2, 6-8. Alevizon, W. S. and M. B. Brooks. 1975.. The comparative structure of two western Atlantic reef-fish assemblages. Bull. Mar. Sci. Vol. 25t No. 4, p. 482-90. Bak. R. P. M. 1978. Lethal and sub-lethal effects of dredging on roof coral. Mar. pollution Bull. vol. 9, p. 14-1. Booth, C. R.; Morrow, J, H. 1990. Measuring ocean productivity via natural fluorescence, Sea Technology, Feb. p- 33-38. Bortone, S. A.; Hastings, R. W.; Oglesby, J. L. 1986. quantification of reef fish assemblages: a comparison of several in situ methods. Northeast Gulf Sci. Vol. 8, No. 1. P. 1-22. *Brock. R. E. 1982. A critique of the visual census method for assessing coral reef fish populations. Bull. Mar. Sci. Vol. 32, NO.1, p. 269-76. *Brock. V. E. 1954. A preliniiary report on a method of estimating reef fish population. J. Wildl. Mgt, Vol. 18, No. 3, p. 297-317. *Brown, B. E.; Howard, L.S. 1985. Assessing the effect of “stress” on reef corals. Adv. Mar. Biol. 22:1-63. Carpenter, R. A. Maragos, J.M 1989. How to asress environmental impacts on tropical islands and coastal areas. Honolulu, HI., Environment and Policy Institute East-West Center. Chamberlin, W. S. ; Booth, C. R.; Kiefer, D.A. ; Morrow, J.H. ; Murphy, R. C. Evidence for a simple relationship between natural fluorscence, photosynthesis, and chlorophyll in the sea. Deep Sea Research. In press. 1990. *Christie, H. 1983. Use of video in remote studies of rocky subtidal interactions. Sarsia, Vol. 68, p. 191-94. D’Elia, C. F.; Taylor, P. R. Disturbances in coral reefs: lessons from Diadema mass mortality and coral bleaching. in: Proceeding: Oceans’ 88, Vol. 3, p. 803-07. Demartini, E. E.; Roberts, D. 1982. An empirical test of biases in the rapid visual technique for census of reef fish assemblages. Mar. Biol. Vol. 70, p. 129-34. Department of Health, State of Hawaii. 1989. Apendment and compilation of chapter 11-54 Hawaii Administrative Rules. *Dodge, R. E.; Logan, A.; Antonfus, A. 1982. Quantitative reef ssegsment studies in Bermuda: a comparison of methods and preliminary results. Bull. Mar. Scl. Vol. 32, No. 3 p. 745-60. Dudley, W., Hallacher, L. 1989. Hilo Sewage Study. Hilo Hawaii, University of Hawaii Marine Option Program. Fricke, H. W. 1973b. Behaviour as part of ecological adaptation–In situ studies in the coral reef. Helgolander wissenschaftliche Meersuntersuchunger, Vol. 24, p. 120-44. *Gamble, J. C. Diving. in: N, A. Holme and A.D. Molntyre, (eds). Methods for the study of marine benthos. Oxford, Blackwell Science Publications. (IBP Handbook no. 16) p. 99-139. *Hisoock, K. 1979. Systematic surveys and monitoring in nearshore sublittoral areas using diving. In: D. Nichols (ed). Monitoring the marine environment, Symposia of the institute for Biology, 24. Institute of Biology, London, p. 55-74. Hourigan, T. F.; Tricas, T. C.; Reese, E. S. Coral Reef Fishes as indicators of Environmental Stress in Coral Reefs. In: D. F. Soule and G. S. Kleppel (eds). . Marine organisms as indicators. 1988. New York, Springer-Vorlag. *Hulburt, A. W.; Pecci, K. J.; Witman, J. D.; Harris, L. G.; Sears, J. R.; Cooper, R. A. Ecosystem definition and community structure of the nacrobenthos of the NEMP monitoring station at Pigeon Hill in the Gulf of Maine. NOAA Tech. Memorandum NMFS-FINEC-14. Jokiel, P. L.; Maragos, J. W.; and Franzisket, L. 1978. Coral growth buoyant weight technique. In: D. R. Stoddart and R. E Johannes (eds). Coral reefs: research methods. Monographs on oceanographic methodology. UNESCO, Paris. p. 529-42. Kelleher, G.; Dutton, 1. M. 1985. Environmental effects of offshore tourist developments of the Great Barrier Reef. Proc. 5th. Int. Coral Reef Symp. Tahiti. Vol. 6, p. 525-30. *Kenchington, R. A. 1978. Visual surveys of large areas of coral reefs. In: D. R. Stoddart and R. E. Johannes (eds). coral reefs: research methods. Monographs in oceanographic methology. UNESCO, Paris. p. 149-62. *Loya, Y., 1978. Plotless and transect methods. Monographs on ceanographic methodology, UNESCO, Paris, 5, 197-217. Maragos, J. E. 1978. Measurement of water volume transport for flow studies. In: D.R. Stoddart and R.E. Johannes (eds). Coral Reefs,. research methods. Monographs on oceanographic methodology, UNESCO, Paris. p. 353-360. Marsh, J. A., Jr. , and S. V. Smith. Productivity measurements of coral reefs in flowing water. In: D. R. Stoddart and R. E. Johannes (eds) . Coral reef: research methods. Monographs on oceanographic methodology, UNESCO, Paris. p. 361-378. *McIntyre, A. D., Elliott, J. M.; Ellis, D. V. 1971. Introduction: design of sampling programmes. In: N. A. Holme and A. D. McIntyre, (ods). Methods for the study of marine benthos. Oxford Blackwell Science Publications (IBP Handbook no. 16) P. 1-27. Nash. S. V. 1989. Reef diversity index survey method for nonspecialists. Tropical Coastal Area Management, Vol. 4, No. 31 p. 14-17. 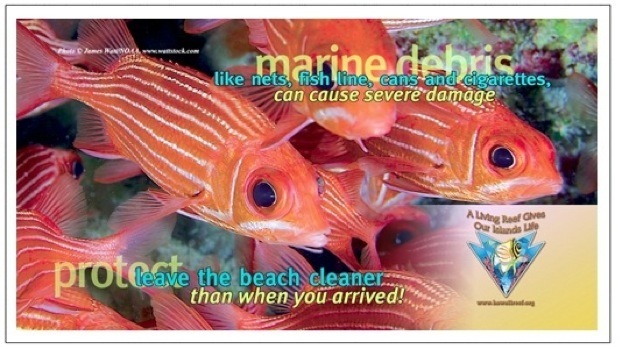 *National Marine Fisheries Service. 1-977. Ocean Pulse program development plan, Woods Hole, Mass, Northeast Fisheries Center. Piclion, M. 1978. Quantitative benthnic ecology of Tulear reefs. In: D. R. Stoddart and R. E. Johannes (eds). Coral reefs: research methods. Monographs on oceanographic methodology UNESCO, Paris. p. 163-74. Pielou, E. C. 1966. The measurement of diversity in different types of biological Collections. J. Theoretical Biol. Vol. 13, p. 131-44. Reese, E. S. 1981. Predation of coral by fishes of the family Chaetodontidae: Implications for conservation and management of coral reef ecosystems. Bull. Mar. Sci. Vol.31, No. 3, p. 594-604. Salm, R. V. and Clark, J. R. 1984. Marine and coastal protected areas: A guide for Planners and Managers. Gland, Switzerland, International Union for conservation of nature and natural resources. Shannon C. E.; Weaver, W. 1948. The mathematical theory of communication. Urbana, 11, Univ. of Ill. Press, p. 1-117. Stoddart, D. R.; Johannes, R. E. (eds). Coral reefs; research methods. Monographs on oceanographic methodology UNESCO, Paris. Weinberg, S. 1978. The minimal area problem in invertebrate communities of Mediterranean rocky substrata. Mar. Biol., Vol. 49, p. 33-40. Weinberg, S. 1981. A comparison of coral reef survey methods. Bijdragen tot de Diefkunde, Vol.-51, p. 199-218. Witman, J. D. 1985. Refuges, Biological disturbance, and rocky subtidal community structure in New England. Ecol. monogr. Vol. 55, p- 421-45. *Witman, J.; Coyer, J. 1990 The underwater catalogue: A guide to ethods in underwater research. Ithica, N. Y. Shoals Marine aboratory, Cornell University. *Ziemann, D. A. 1990. Water quality and marine life monitoring and mitigation plan Kohanakik Resort. Prepared for Nansay Hawaii, Inc. Kamuela, HI.